Why a Hawaii Wildfire webapp? As an organization that serves all who live, work, or visit the Hawaiian Islands and parts of the Western Pacific, we want to make wildfire-related information readily available at your fingertips. We hope this app will be useful for you to learn more about the wildfire hazards in your own area so that you will be better equipped to take action in your community. What does the Hawaii Wildfire webapp do? The HWMO webapp visualizes wildfire data across Hawaii. It has four types of data: fire history, community hazard assessments, community input information, and census data. We want to say a big thank you to Niklas Lollo and Evangeline McGlynn, PhD candidates at the University of California, Berkeley, for developing the app in conjunction with Data Sciences for the 21st Century. Their hard work and dedication to this app no doubt shows in the final result. If you have any questions or feedback, you can e-mail HWMO at admin@hawaiiwildfire.org or call (808) 885-0900. Check out this brand new resource to learn how the wildfire season went in Hawaii in 2017 with this Pacific Fire Exchange fact sheet. Download the full fact sheet by clicking the button below. "Every wildfire incident is part of a larger pattern of wildfire occurrence and is an opportunity to gain experience and insight for wildfire management. Taking a look at both the big picture and individual fires can: Deepen and expand our understanding of wildfire drivers, behavior, and response; improve wildfire response, management, and science; reduce negative impacts on individuals, communities, natural resources, and response agency budgets." Tagged: Fire History, Climate Change and Fire, Incident Reports, Invasive Species, Wildfire & Drought Look Out! Did you know that the average area burned per year in Hawaii has increased 400% over the past century? Check out this Pacific Fire Exchange fact sheet that presents Hawaii Wildfire Management Organization's State Wildfire History Map and Dr. Clay Trauernichts' key findings from his research on the scale and scope of wildfire in Hawaii. Tagged: Climate Change and Fire, Fire Ecology (Hawaii), Invasive Species, Maps, Publications, Wildfire & Drought Look Out! Hawaii has a devastating wildfire problem. While under-publicized nationally, the scale and scope of wildfires in Hawaii are extreme. Take a look and please share widely! As climate change continues to reshape the lands and waters of Hawaii, wildfire will be increasingly on the radar. Climate change contributes to conditions known to increase wildfire hazard. More wildfires in Hawaii mean less native forests and drinking water and more erosion/runoff, coastal brownouts, and communities at risk. Please share this infographic far and wide and remember, there is a lot you can do to protect your family, home, and community! "People who work for the Department of Land and Natural Resources are committed to fulfilling the agency’s mission of managing and conserving the state’s natural and cultural resources for future generations. With nearly 900 employees working throughout the state, job opportunities within the department require various levels of education and expertise ranging from a high school education up through advanced degrees. If you are interested in pursuing a career as a conservation enforcement officer, aquatic or wildlife biologist, environmental engineer, archaeologist or cultural historian, the Department of Land and Natural Resources is the place for you." "This PFX Training Module is a self-paced mini-course that includes short self-assessments throughout. Understand how fuel type, characteristics, arrangement, and environment affects fire risk and fire behavior. Be able to identify hazardous fuels types and arrangements on a landscape. " HWMO spearheaded the effort to write and implement this 2016 Western Oahu Community Wildfire Protection Plan (CWPP). 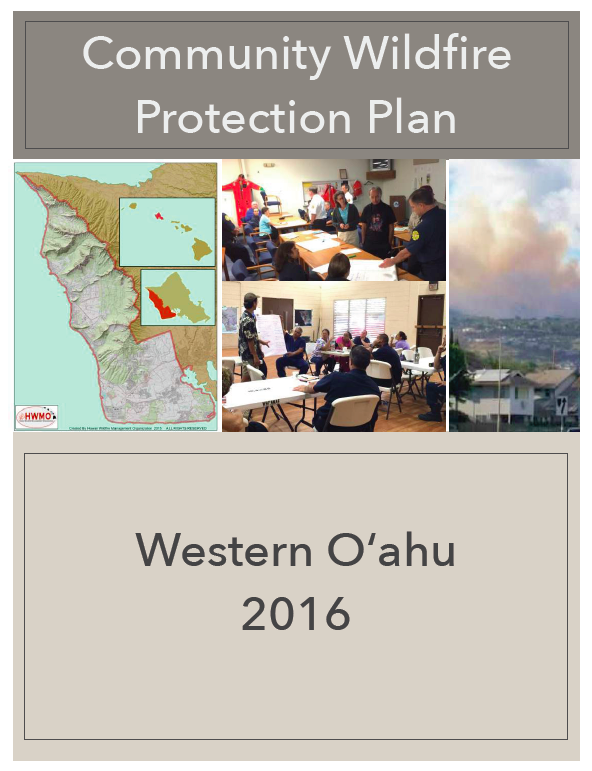 HWMO spearheaded the effort to write and implement this 2016 Upcountry Maui Community Wildfire Protection Plan (CWPP).